In the morning, from the north, under a bright sunshine, we climbed the Col de La Madeleine, a classic of the Tour since 1969 with its 25.3 km at 6.2% average for a total of 1585 m gain to culminate at 2000 m of altitude. It was a quiet day on the Madeleine. Everyone else was patiently awaiting the Tour on the other side of the Col in the next valley. We’re in no rush. At the summit, we stopped for the classic monument photos before saddling up once more for the descent towards the Maurienne Valley. Halfway down, we halted for a scenic picnic - fresh baguette, local Savoyard cheeses and ham, cool gazpacho, some French wine and Belgian beers. It was nice, but no time for nap. We continued en route to catch the peloton on their last ascension, passing over the Col de Chaussie, next day stage start climb. Once at destination, we ran into Steve’s former Motorola teammate Phil Anderson with his guests. 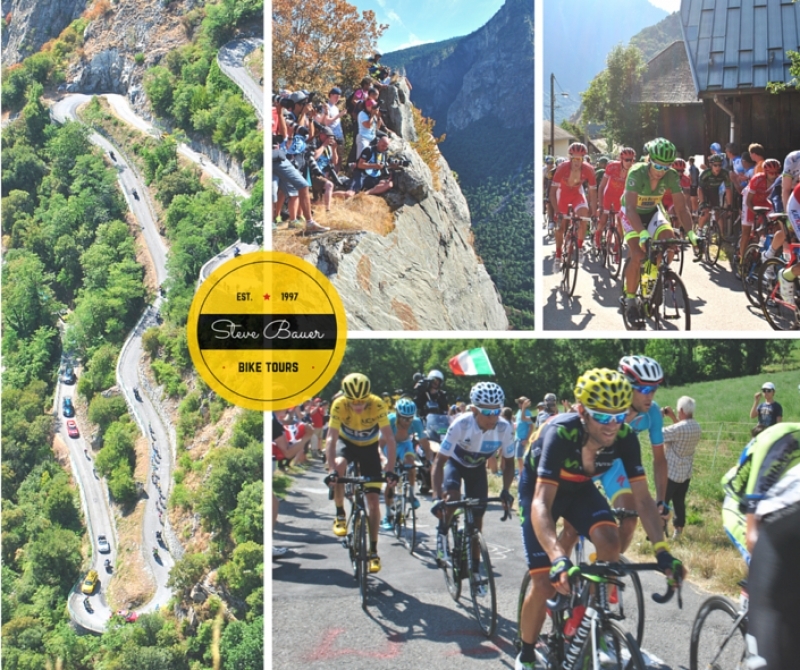 This is when you know this is the place to be; when two former pros are ending their stage day in the same alpine village, away from the big circus crowds. Steve and Phil, shook hands, hugs, photos, and up we are on a mission to get to the balcony improvised media box on the side of a cliff to watch solo breakaway start the ascension. 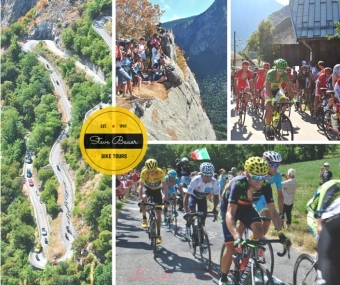 Bardet was followed by a chase of 8 riders attacking the 18 hairpins of the Lacets de Montvernier (Alt 782m, 3.4km, 8.2 % air.) at 14 km to go.